Spraying seedlings with gibberellins (4+7) when leaves were greater than one inch long increased the number of flowers per plant (Orvos et al., 1989). Member of the Gesneriaceae (gesneria family). 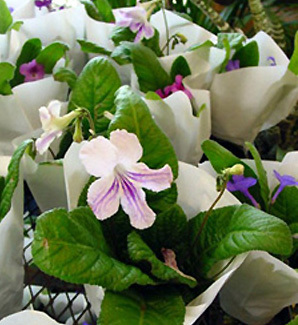 Two very common relatives are African Violet and gloxinia. Flowers tubular, spreading to trumpet-shaped, held above foliage. Some favorite cultivars and their respective flower colors include ‘Hera’ (maroon with white picotee) and ‘Sirius’ (purple with white picotee). Unless the seed pods are wanted, remove them before they develop for a better looking plant and possibly more flower production. Needs more light than most indoor plants.